Usain Bolt is off for a much-needed vacation after making a quiet return to the island on Monday following a reported business trip to England, where he was for the last few days after making history at the 2016 Olympic Games in Brazil. 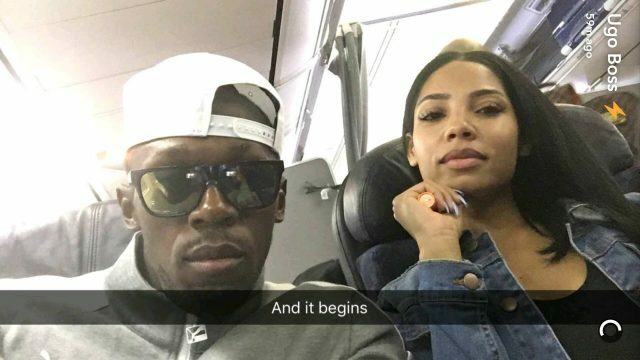 Seated on a flight, Bolt shared a photo to his Snapchat account with the caption, “And it begins,” signalling to fans that he and his girlfriend Kasi Bennet are on their way to undoubtedly a lovely vacation spot. The superstar also shared a video featuring Kasi — smiling and waving– before boarding. Bolt has said the 2016 Olympic Games will be his last Olympics, but the legend is expected to compete at next year’s World Championships in London.